Maria and Bryan Chapin-Cao first met in Beijing during an intercultural exchange outing. After more than two years of traveling and living together, they married in a traditional Chinese wedding ceremony in Beijing. 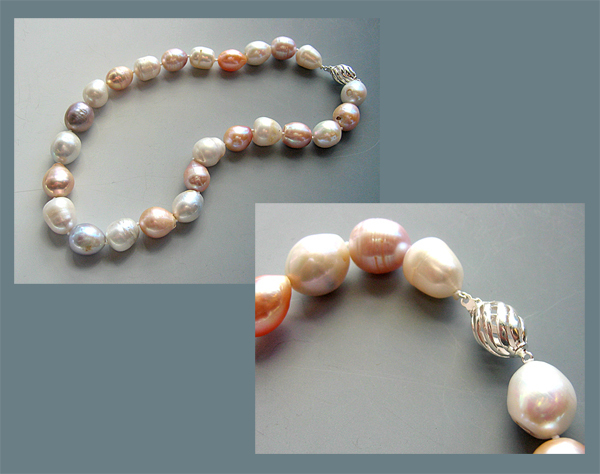 "Pearls by Nature" is their consuming passion. Traveling through central China, Maria and Bryan met and befriended a wonderful group of pearl "farmers". These farmers facilitate the growth of pearls in a process called "culturing", using techniques first developed over one hundred years ago that are constantly being improved. Pearl culturing involves implanting an irritant into the body of the mollusk and then placing the mollusk into proper growing conditions. 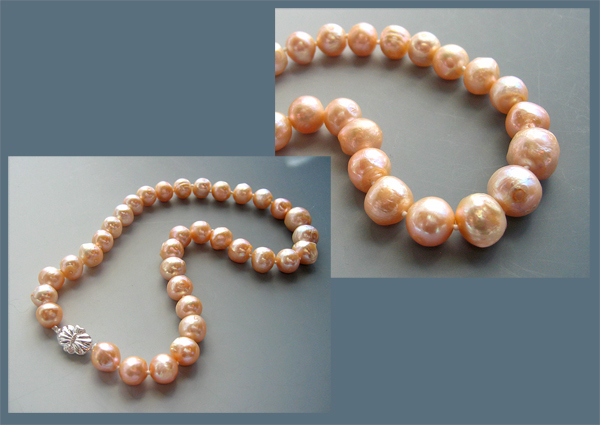 Our Chinese friends culture their pearls inland, therefore create pearls in a condition called "freshwater". These small freshwater ponds are nurtured and the water quality monitored for three to five years before harvest. This process is environmentally friendly because it requires the ecosystem to be clean and carefully tended. 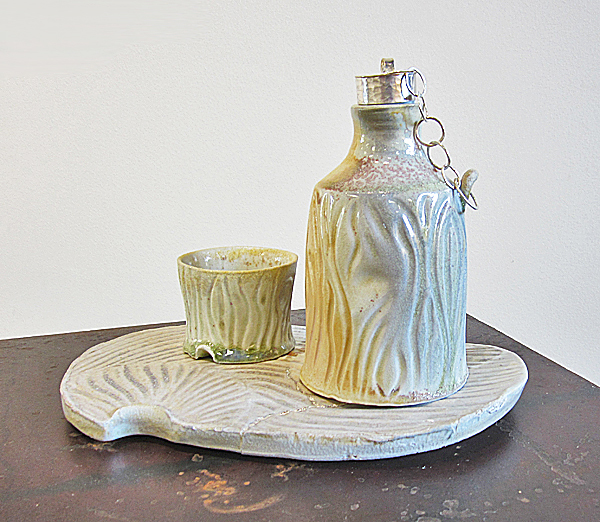 All parts of the mollusk are used, creating no waste. The body of the mollusk is used for both human and animal consumption. 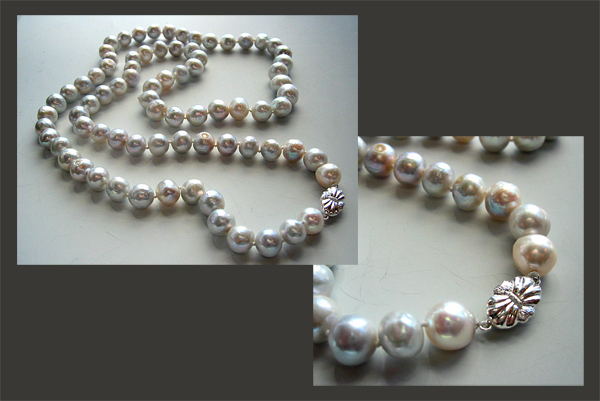 The pearls are highly sought after, and the shell is used for both jewelry and as an organic fertilizer. 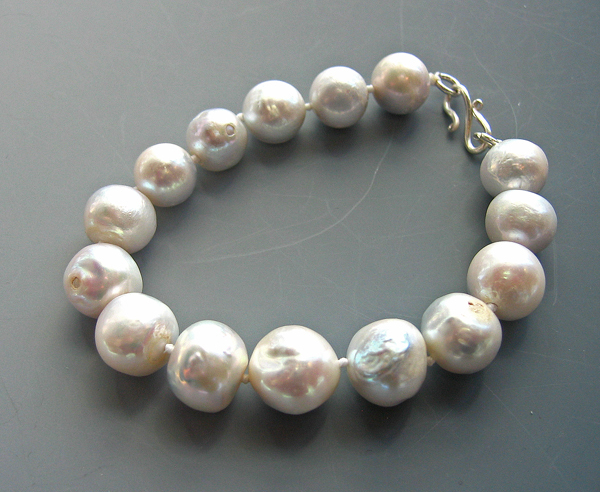 "We find pearls to be naturally beautiful, no two being exactly the same. 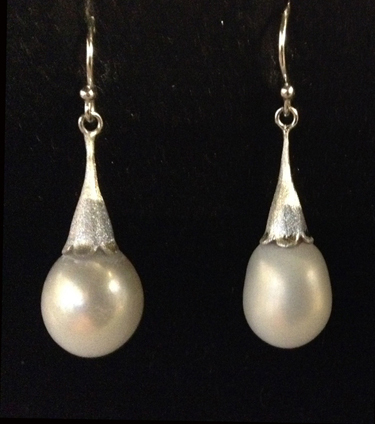 We make our jewelry in such a way as to bring out the exotic luster and natural beauty that has been a symbol of wealth and beauty for women since the dawn of recorded history. 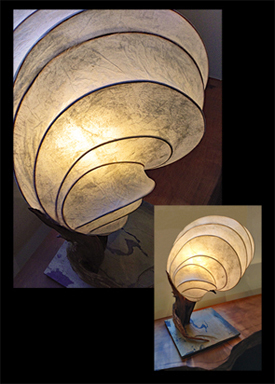 We take great pride in our work and our unique creations give us great joy, a joy equal in parts to knowing that there will be someone purchasing our work who can understand and appreciate the intrinsic beauty, which we have labored so hard to bring forth." 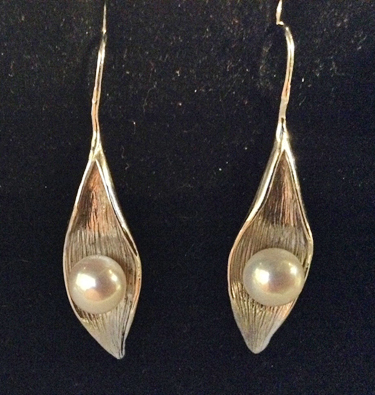 Sterling silver and leaf pearl earrings. Matte finish. 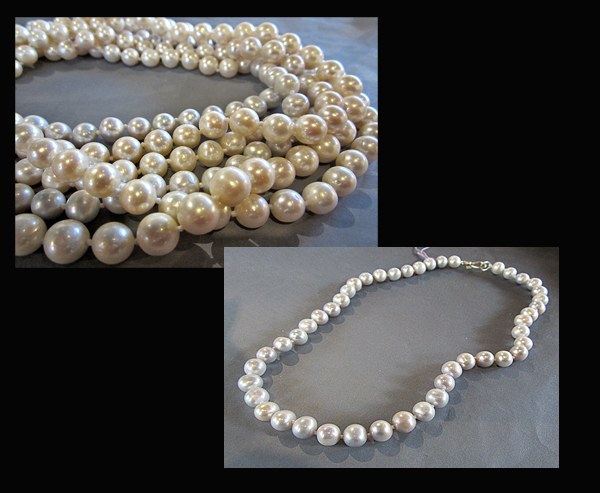 Sterling silver, large white pearls, 13mm; these large pearls took 7-10 years to grow. 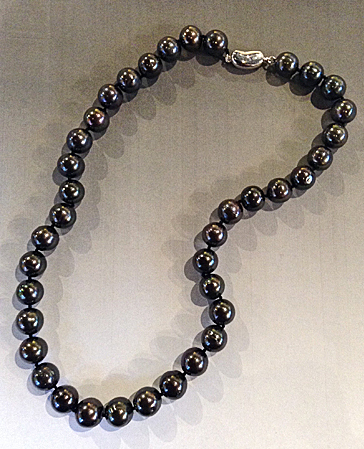 Black peacock pearls. 10.5" - 11.5". 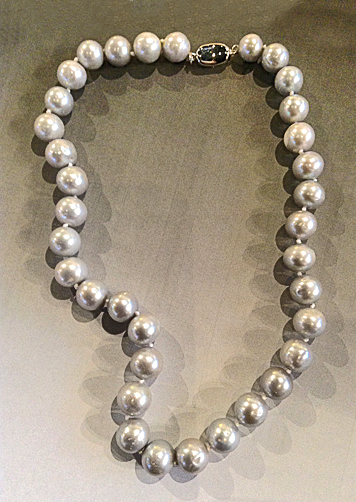 CHAPIN-CAO: Silver-Grey Pearl Necklace, 18"
Silver grey freshwater pearl necklace, 9-10mm, 18". Sterling silver S-hook clasp. Natural color. Off-round with tiny blemishes. 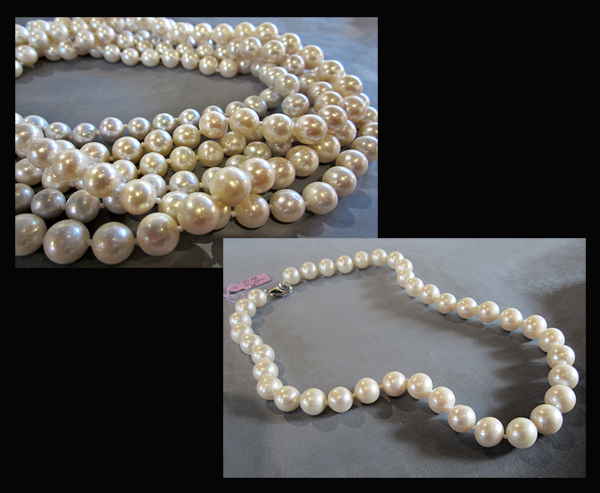 CHAPIN-CAO: White Pearl Necklace, 18"
White freshwater pearl necklace, 10-11mm, 18". Sterling silver lobster clasp.